October is National Fire Prevention Month. As such, there is no better time to consider how your workplace can benefit from FireStop systems and installation. October is National Fire Prevention Month. As such, there is no better time to consider how your workplace can benefit from FireStop installation. Homes and businesses alike can be equipped with FireStopping measures that can help prevent fires and control any fires that do start. Whenever a new building is under construction, it is vital to include FireStop systems. That’s because it can help reinforce and protect fire-rated barriers in walls and floors. It does this by filling in any potential gaps that would otherwise allow a fire to spread. These gaps, holes, and pits could arise during new construction or renovation of an existing structure. The old saying “where there’s smoke, there’s fire” is part of the reason FireStop systems were invented. 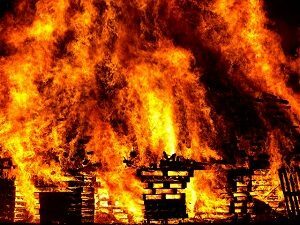 These systems can capture and divide the smoke and the flames from a fire, containing the fire and facilitating the evacuation of the affected building or buildings. However, even small holes in walls, ceilings, or floors can allow the smoke and the fire to move, which will put even more people and assets in danger. Installation of FireStop systems is required by building codes no matter where your building is located. That’s why they are so important – also, they will help ensure that you can keep all of your building’s occupants safe in the event of a fire. Smoke inhalation is the most common cause of death during a fire emergency, and that is what FireStop is so effective at reducing. By installing FireStop systems, you can take steps to decrease the risks of injury and death to everyone inside your building. When you need FireStop systems installed, put your trust in the experts at G&M Services. We know all of the building codes and UL systems that apply to your building. Although you may not recognize them, you don’t have to be. We can handle all of it for you instead. G&M Services also offers services in the way of concrete drilling and sawing, concrete scanning and FireStop. To get started, call today at 410-787-8828 or visit our contact page. Follow the official company page today on Google+, Facebook, Twitter, and LinkedIn. This entry was posted on Friday, October 5th, 2018	at 9:21 am	. Both comments and pings are currently closed.